Maryknoll joins 600+ women in nonviolent civil disobedience to end family detention and reunite the children with their parents. More than 600 women were arrested in an act of nonviolent civil disobedience at the Hart Senate Building in the U.S. Capitol Building complex in Washington, D.C. to protest the Trump administration's immigration policies on Thursday, June 29, 2018. 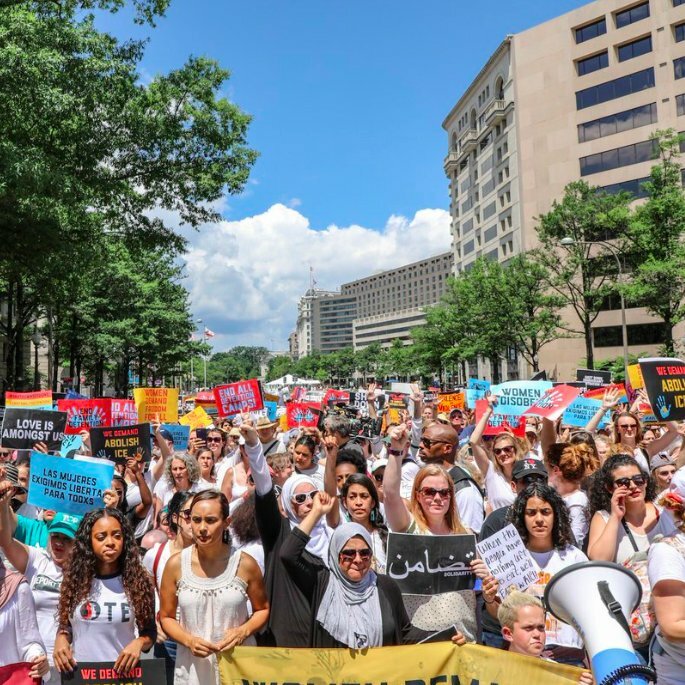 The "End Family Detention: Women Take Action" march and nonviolent action was organized by the Center for Popular Democracy and the Women's March. Susan Gunn, Communications Manager for the Maryknoll Office for Global Concerns, joined the march and the action inside the Senate Building, which were purposely held ahead of the coming weekend "Families Belong Together" protests across the country. "I think we showed people across the country what needs to happen this weekend and beyond," said Susan Gunn. "We need to tell President Trump and Congress that ending family separation, without a real plan to quickly reunite the children with their parents, and only to replace it with family detention, is not the answer to our broken U.S. immigration system." Hundreds of women gathered at a park near the White House at 8 a.m. to add their names to the list of those planning to risk arrest and get ready for the day. "I always like to sit in front when Linda Sarsour gives a training on nonviolent civil disobedience," Gunn said with a smile, referring to one of the organizers of the Women's March. 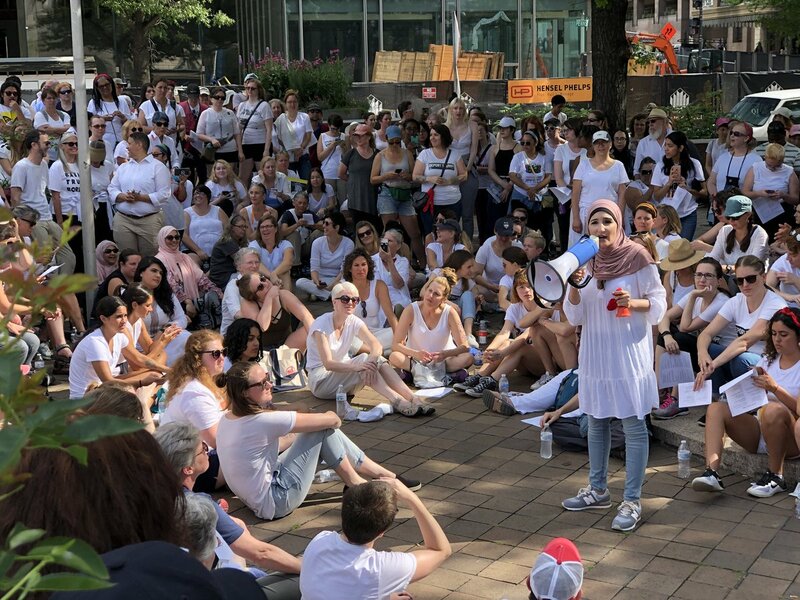 Photo: Susan Gunn (white hair, sunglasses) sits on the ground, center left of speaker, Linda Sarsour, pictured with the bullhorn, during a nonviolent civil disobedience training before the End Familiy Detention action on June 28, 2018. Photo courtesy of the Women's March. After the training, an estimated 1,000 women set off on a two-mile march to the U.S. Capitol. "We began by singing "Women gonna rise like the water, gonna shut detention down. I hear the voice of my great granddaughter, saying free all families now." Click here to watch a 1 minute video of the singing by the Center for Popular Democracy. "First, we marched past the Trump International Hotel while chanting 'shame' and 'where are the children.' We could see people inside the hotel watching us from the second floor windows." The route for the march was about two miles long and the weather was sunny and extremely hot. "We left the Trump Hotel and went on to march completely around the Department of Justice, some parts in silence, some in chants and song, singing This Little Light of Mine, while people who looked to be employees watched and even filmed us from their office windows." Many of the women held signs that read "End Family Detention," "Women Disobey," and "Abolish ICE." When the march reached the front entrance of the Department of Justice, the women sat in the street, effectively blocking traffic and all comings and goings from the entrance for about an hour. "This was the first part of our planned nonviolent action. We sat in the street, raised our hands and repeatedly chanted the words "We care" which were written on our palms," Gunn said. "1,000 women wearing white and chanting together is quite a raucous." Luckily, some clouds blocked the sun for a few minutes and the women were soon ready to march on to the U.S. Capitol. Two hours after setting off on their march, the women reached the Hart Senate Building. "A few women fainted due to the heat along the way, especially as we marched up the hill leading to the U.S. Capitol. There were repeated shouts for medics who were situated all along the march route. We were so grateful for these volunteers." Once inside the Hart Senate Building, the 600+ women risking arrest gathered in the central atrium while an estimated 400 women cheered them on from the balconies above. On cue, all the women raised their hands and repeated the "We care" chants for many minutes. When those leading the loud, massive group rang small bells they had brought with them, the women risking arrest sat down and wrapped themselves in the same type of foil blankets as those given to children in detention. The deafening chanting and singing went on for about two hours while the police arrested the women in small groups and a few senators stopped by to show their support. The last of the women arrested was released from police custody just before 8 p.m. – twelve hours after the women had first gathered. "My voice is hoarse and my ears are still ringing from the hours of loud chanting and singing," Gunn said the next morning. "It was incredibly moving to chant "We care" ... "Where are the children" ... "Stop stealing babies" ... "Abolish ICE" ... all while wrapped up in a flimsy foil blanket and sitting on the Senate Building floor." About joining such a large group of women in nonviolent civil disobedience, Gunn said "Using my priviledge to give a voice to the immigrant children and families suffering in detention, and to carry it to Congress, is an honor and a blessing. I believe we really meant it when we sang 'Women gonna rise like water.' To hear it echo off the walls inside of the Senate building and down the hallway as the police led us outside under arrest, made me feel that we can really do this. Women and families can lead the way. We can stop separating and detaining families; we can start using alternatives to detention; and we can start addressing the root causes of the violence that is driving people to flee Central America and seek safety in the United States." All photos courtesy of the Women's March.